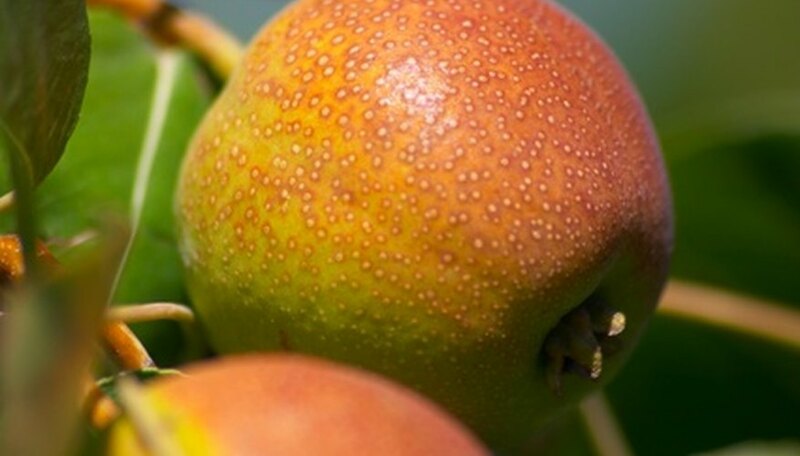 Fire blight is a disease found in most pear and apple growing areas in the United States. Fire blight causes large amounts of destruction to blossoms, fruits, scaffold limbs and leaves, making it one of the most damaging tree diseases for fruit bearing plants. Blight is often found once the weather reaches a regular 70 degrees during the summer and when the weather is humid. Fire blight is characterized by a sudden wilting and blackening of blossoms and leaves on the tree. Blight in the terminal of the tree will cause the terminal to curl. Dead leaves stay on the tree. Eventually, dark spots appear on the branches, separated from healthy parts of the tree by cracks. Pears will turn black as the disease spreads. The bacteria that causes fire blight lives in the bark of the tree. These turn into cankers which drip a fine amber liquid that spreads the disease throughout the tree. Infection will usually be noticed within a week of the cankers opening. Fire blight can be stopped by the application of chemical controls. Chemicals containing the antibiotic streptomycin are most effective against fire blight. Spray should be applied just before blossoms open on the pear tree, to be repeated at four- to seven-day intervals during the blossoming season. This works out to be three to four sprays. This may be mixed with a copper fungicide application and should be resprayed if there is a rain. Controlling blight by preventative procedures is the most effective way to control the disease. Blossoms that show signs of the disease should be cut off from the plant, as well as twigs and branches. Branch cuts should be made up to 12 inches away from the infection. All infections from a previous year should be cut off the tree and burned to prevent spreading. Blight, in the end, has no cure. If a large area of trees have been infected and new trees are desired, they should be planted far away from the area of infection as the disease spreads through the soil. New trees should also be planted in an area that is not touched by wind that runs through an old orchard that is filled with infected trees.